Ben Simpson is Special Counsel in Withers’ corporate team, based in London. Ben advises on private equity, mergers and acquisitions, joint ventures and on company law and partnership/LLP law. He advises a number of clients on their controlling interests in quoted companies and the associated regulatory implications, and participated in consultations with the Takeover Panel on the close relatives and related trust concert party presumption and with the ICSA regarding the PSC regime which came into force on April 6, 2016. U.S. fund managers, entrepreneurs and members of their families who are beneficial owners are often surprised by the long reach of the UK’s PSC Regime for making public the direct and indirect controllers of UK entities. Since 6 April 2016, most UK companies, limited liability partnerships ('LLPs') and some other entities have had to keep a register of individuals who have significant control over them ('PSCs') and this includes indirect controllers. Where UK entities are ultimately controlled by US persons, this will often result in a US individual being publicly disclosed in the records of the UK’s Registrar of Companies which are accessible online. The UK’s Small Business, Enterprise and Employment Act 2015 (the ‘SBEEA') introduced the PSC regime by inserting new provisions into the UK’s Companies Act 2006 (the ‘Companies Act'). The requirements in Part 21A of the UK Companies Act and the Register of People with Significant Control Regulations 2016 (the ‘PSC Regulations') as amended by the Information about People with Significant Control (Amendment) Regulations 2017 (the ‘Amending Regulations'), apply to UK incorporated companies limited by shares (including companies admitted to AIM and the NEX Exchange), companies limited by guarantee, unlimited companies, unregistered companies and Societas Europaea ('SEs'). LLPs are also subject to the requirements. The regime for eligible Scottish Partnerships (SLPs and SQPs) is set out in The Scottish Partnerships (Register of People with Significant Control) Regulations 2017 (the ‘Scottish Regulations'). Even if an entity in question is not required to keep its own PSC register, please note that the entities which fall outside the scope of our PSC legislation may still be required to disclose their ownership or control of companies which have to identify and register their PSCs. The PSC Regime implements what the UK Government believes to be all, of the UK’s obligations under the Fourth Money Laundering Directive ('4MLD') which came into force on 25 June 2015. The Fifth Money Laundering Directive ('5MLD') was adopted by the European Parliament on 19 April and, subject to final approval by Council of the European Union, will need to be implemented by Member States in late 2019/2020. Whether or not the UK will enact equivalent measures to those in 5MLD following Brexit has yet to be determined. Key changes to be introduced by 5MLD are anticipated to include (i) access to beneficial ownership on trusts (and similar legal arrangements) by any person who can demonstrate a legitimate interest, and (ii) access to beneficial ownership of trusts upon written request, where the trust (or similar legal arrangement) owns a controlling interest in any body corporate or other legal entity incorporated outside of the EU (so disclosure might be required of trust and other legal arrangements which own a controlling interest in a US entity). The 5MLD trust disclosure regime will apply to trusts where the place of establishment or residence of the trustee (or person holding an equivalent position in a similar legal arrangement) is in the EU or when the trustee (or person holding an equivalent position in a similar legal arrangement) enters into a business relationship or acquires real estate in the EU in the name of the trust or similar legal arrangement. A further disclosure measure is also being introduced in the UK which will require overseas entities that own property in the UK or enter into government contracts to disclose their beneficial ownership on a register which is expected to be operational by early 2021. 1. I have nothing to do with any of the UK entities in our structure and so surely I cannot be caught by the UK’s PSC Regime? There are two elements to the UK PSC Regime. First, an individual may be a person with significant control ('PSC') if they have the right to exercise, or actually exercise, significant influence or control over a UK company, UK LLP or other UK legal entity directly. Other UK entities, such as companies limited by guarantee and Scottish limited partnerships and Scottish ‘qualifying’ general partnerships are also subject to the PSC Regime. A person will be a PSC if they satisfy one or more of the five conditions set out in Part 1 of Schedule 1 to this note. (d) the person has the right to exercise, or actually exercises, dominant influence or control over the legal entity. Whilst in some cases it will be easy to evaluate whether or not a person (including a trust or firm) has a majority stake, consideration also needs to be given as to whether or not two or more persons may be deemed to hold a majority stake by virtue of a ‘joint arrangement’ or a joint interest. A person may be treated as being a party to a joint arrangement notwithstanding that no ‘arrangement’ exists which has any effect in law. This is relevant to both direct and indirect significant influence or control. A joint arrangement is defined as an arrangement between the holders of shares (or rights) that they will exercise all or substantially all the rights conferred by the respective shares (or rights) jointly in a way that is predetermined by the arrangement. The definition of arrangement goes beyond legally binding arrangements and includes ‘any scheme, agreement or understanding, whether or not it is legally enforceable, and any convention, custom or practice of any kind’. It is therefore wide-ranging in practice. There is one caveat which is that ‘something does not count as an arrangement unless there is at least some degree of stability about it (whether by its nature or terms, the time it has been in existence or otherwise)'. The official UK guidance on the PSC Regime would suggest that where family members are participants in an entity, a joint arrangement is quite likely to occur. However, the guidance stops short of suggesting that there will be a presumption that family members are party to an arrangement. The breadth of the definition of joint arrangement means that a person with a small stake in an entity which holds an indirect stake in an underlying UK legal entity could be found to satisfy the majority stake test by virtue of a joint arrangement. That person may then be attributed with the rights of the underlying legal entity in which they have a majority stake and be a PSC, notwithstanding that they have no involvement in practice with the entity in question. Please see Schedule 3 to this note for an illustration of indirect PSCs who are party to a joint arrangement or have a joint interest. 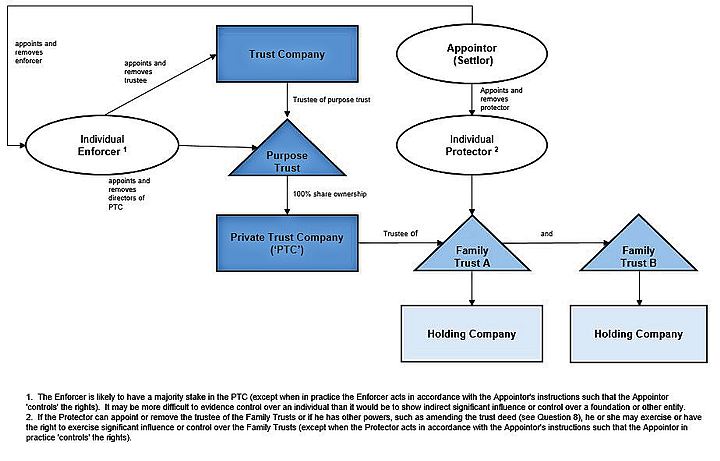 The other aspect of the majority stake test, as it applies to trusts or firms, is that it then brings in persons who actually exercise, or have the right to exercise, significant influence or control over the trust or firm which, in the case of a trust and depending on the circumstances may result in a settlor, protector, appointor or a beneficiary being a PSC of the underlying UK entity. A person may also be caught as a PSC because they control a legal entity, such as a US limited liability corporation ('LLC') which acts as the managing member of another LLC. A person will be attributed with significant control of a UK entity which is subject to the PSC Regime if they meet one or more of the five specified conditions referred to in paragraph 1 above, including by virtue of having a majority stake in an entity further up the chain. The fourth specified condition refers to otherwise having the right to exercise, or actually exercising, ‘significant influence or control’ over a company or LLP and the fifth specified condition contains similar language. There is both Statutory and Non-Statutory Guidance on the meaning of ‘significant influence or control’ in this context and this is explained further in Part 3 of Schedule 1 to this note. 3. Is it correct that a member with less than 50% of the voting rights in a US LLC could end up on the UK’s PSC register if there was an underlying UK company or LLP? 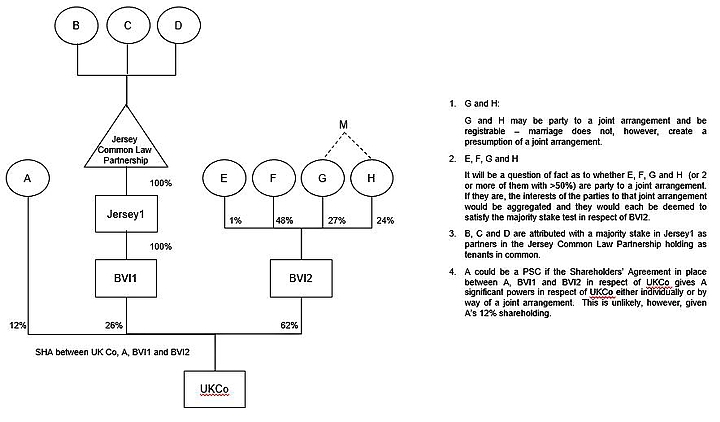 As explained in the response to Question 1, if a joint arrangement exists, persons holding minority interests may be treated as being party to that joint arrangement and attributed with a majority stake in the relevant entity collectively - as a result they may end up on the PSC register of an underlying UK company or LLP. A person may also be caught as a PSC because they control a legal entity, such as a US LLC which acts as the managing member of another LLC. 4. Is it right that managers of US LLCs will not be treated as PSCs of an underlying UK entity? No. Whilst it might be thought that a managing member would be treated like an individual director of an English company and be ‘excepted’, where there is one managing member which is itself an LLC or other legal entity, it will be attributed with a majority stake. If, however, management of the LLC has been delegated to a person who is not a member, that person would be unlikely to have a majority stake unless they have the right to, or actually exercise, dominant influence or control. On the assumption that a typical US LLC will be treated as a body corporate (as so defined under the Small Business, Enterprise and Employment Act 2015 ('SBEEA')), one or more members may also be attributed with a majority stake as a result of the rights they hold under the LLC’s operating agreement. It is then necessary to examine who has the right to vote at general meetings of the LLC on all or substantially all matters that shareholders in a UK company would have the right to vote on in respect of that company (the ‘Voting Rights Test'). The LLC’s operating agreement will need to be carefully examined to evaluate the division of powers between the member(s) and the manager(s) and to ascertain whether or not it is the member(s) or the manager(s) who will be treated as satisfying the Voting Rights Test in respect of the LLC. 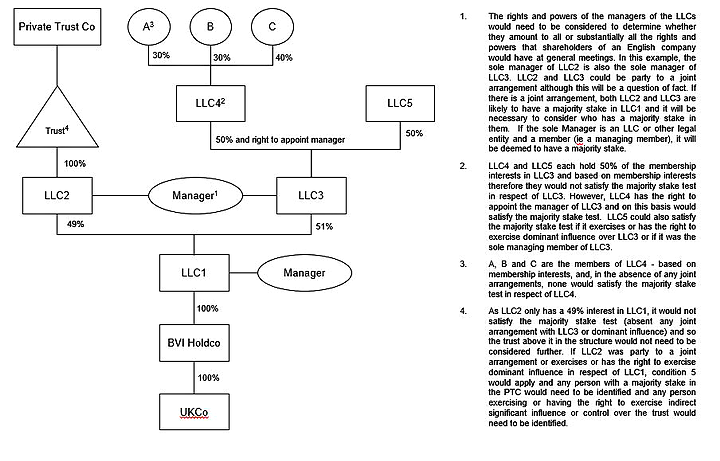 In most LLCs certain key powers will have been reserved to the member(s) such as the right to amend the LLC’s operating agreement, the power to appoint the manager(s) and the power to wind up the LLC and this will often be sufficient to prevent an argument being made that the manager(s) satisfies the Voting Rights Test. A manager who is a member and which is a legal entity may, however, be attributed with a majority stake as explained above. If a manager did satisfy the Voting Rights Test, that manager or, if acting pursuant to a joint arrangement, the managers, may be attributed with a majority stake in the LLC and may then be PSCs of the underlying UK entity. It may not be possible to sustain an argument that a manager occupies an excepted role in that scenario because the excepted role concept assumes a normal distribution of powers between shareholders and directors in an English company. A member of an LLC will often satisfy the majority stake test in respect of that LLC by virtue of having the right to appoint and/or remove a majority of the managers (it being assumed that the managers are the equivalent management body to the board of directors of an English company). Please see Schedule 4 to this note for an illustration of the identification of PSCs of an underlying UK entity in an LLC holding structure. 5. What about an advisory board or committee to an LLC? An advisory board or committee to an LLC may satisfy the majority stake test in respect of the LLC by virtue of actually exercising dominant influence over the LLC even if it does not have the legal levers to give it the right to exercise dominant influence. An advisory board or committee may be treated as exercising dominant influence where the operating and financial policies of the LLC are set in accordance with the wishes of the advisory board or committee and for their benefit, whether or not the wishes are explicit. 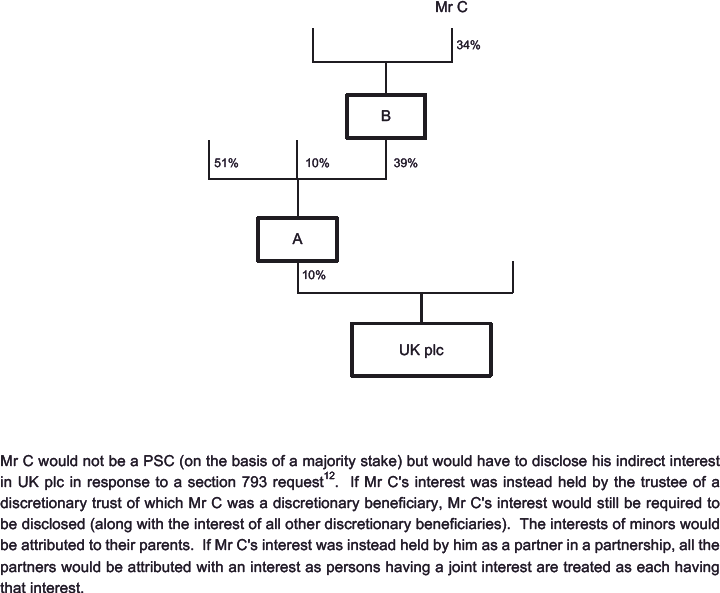 The members of such a board or committee might all then be PSCs of the underlying UK entity if they acted pursuant to a joint arrangement (see the answer to Question 1 above). 6. Is it right that I will not be treated as a PSC if I am a limited partner in a limited partnership? The British Venture Capital Association ('BVCA'), which represents the private equity industry in the UK, lobbied to ensure that limited partners in English limited partnerships were not treated as PSCs. The reason for the BVCA’s concern was that, under English law, the rights of an English limited partnership are treated as being held jointly (as tenants in common) by all of the partners (ie both the limited partners and the general partner). 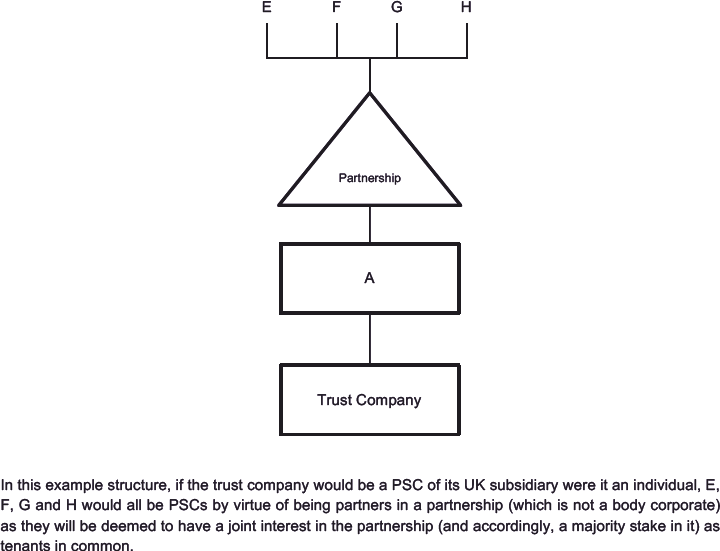 On this basis, without a specific exemption being introduced to the PSC Regime, the risk was that the indirect controllers of limited partners in UK limited partnerships would end up on the PSC register. Amendments were therefore made to the SBEEA to exempt limited partners in limited partnerships from disclosure. Limited partners in a ‘foreign limited partnership’ will also be exempted from disclosure if the foreign limited partnership ‘consists of at least one person who has no, or limited, liability for the debts and obligations of the arrangement and that person does not take part in the management of the arrangement’s business’. The concept of ‘take part in the management’ would be determined in accordance with English law. 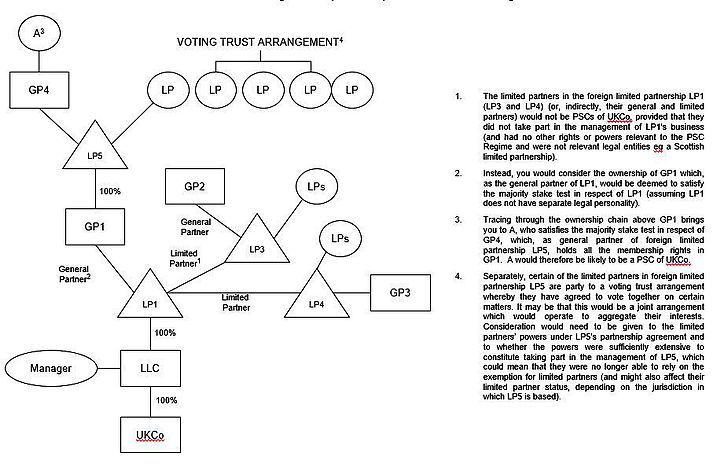 A limited partnership which does not operate in accordance with its constitution and whereby limited partners do, in practice, take part in the management of the limited partnership’s business (which should be unlikely given that in such a situation the limited partner(s) would likely lose their limited partner status) would be at risk of disclosure on the UK’s PSC Register for underlying UK legal entities. Please see Schedule 5 to this note for an illustration of the identification of PSCs of an underlying UK entity in a limited partnership holding structure. 7. What about an advisory board to a limited partnership? As with an LLC, an advisory board or committee to a limited partnership may satisfy the majority stake test in respect of the limited partnership by virtue of actually exercising dominant influence even if it does not have the legal levers to give it the right to exercise dominant influence. An advisory board or committee may be treated as exercising dominant influence where the operating and financial policies of the limited partnership are set in accordance with the wishes of the advisory board or committee and for their benefit, whether or not the wishes are explicit. 8. What if there is a trust at the top of the structure and I have the power to appoint and/or remove the trustees? Under the PSC Regime, special rules apply to trusts. For example, a person who has the right to appoint or remove one or more of the trustees, except through application to the courts or as a result of breach of fiduciary duty by the trustees, would be seen as a PSC of an underlying UK entity in which the trustees had a majority stake by virtue of having significant influence or control over the relevant trust. 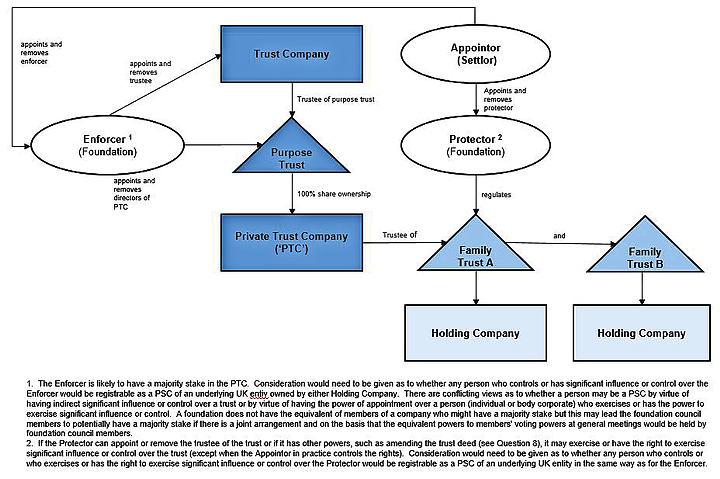 Other powers in relation to trust which may result in someone being treated as a PSC of an underlying UK entity include having the right to amend the trust deed, the right to revoke the trust, the right to direct the distribution of funds or assets or a right to direct investment decisions of the trust. A person is likely to exercise significant influence or control over a trust if they are regularly involved in the running of the trust; for example, they are a person who has issued instructions, which are generally followed, as to the activities of the trust. This may be a settlor who is actively involved in directing the activities of the trust. It could also be a beneficiary. This is ultimately a question of fact and it may be that no surrender of discretion is required by the trustees for another person to be a PSC of an underlying UK entity in which the trustees have a majority stake. This was, in any event, the approach taken by the UK’s Court of Appeal looking at a similar test for ‘shadow directors’. Trustees could therefore find that a court considers there to be a PSC under condition 5 even if the trustees continue to exercise their discretion in accordance with their fiduciary duties. In a recent case, the English High Court has determined that a trust’s assets were held by the settlor rather than by the trust given the settlor’s ongoing control of the trust arrangements. Accordingly the robustness of any trust should be considered when analysing the position under the PSC Regime. 9. What happens if there is a corporate trustee? If there is a corporate trustee, it is necessary to look not only at who has significant influence or control over the trust (ie the fifth specified condition) but also whether anyone satisfies the majority stake test in relation to the corporate trustee itself. Please see Schedule 6 to this note for an illustration of the identification of the PSCs of an underlying UK entity owned by a corporate trustee. If the shares in the UK PTC are owned by a purpose trust, there may not be a PSC of the PTC by virtue of share ownership or voting rights. However, if there is an enforcer who can appoint and/or remove the trustee of the purpose trust, the enforcer (if an individual) is likely to be a PSC of the PTC. The directors of a PTC would not ordinarily be deemed to be PSCs of it themselves. (e) a right to revoke the trust. As mentioned in response to Question 8 above, a person is likely to exercise significant influence or control over a trust if that person is regularly involved in the running of the trust; for example if that person has issued instructions, which are generally followed, as to the activities of the trust. 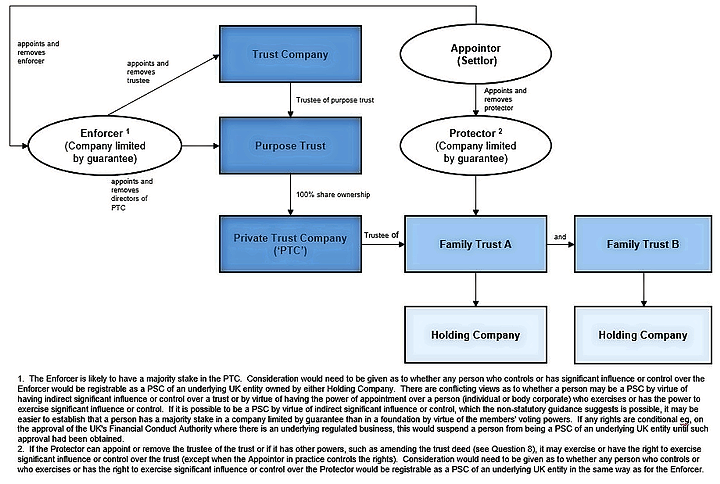 Where UK PTCs are operated by professional trustees, the owners of the trust company may be PSCs if they have a majority stake in the trust company. This might arise, for instance, where you have a partnership which indirectly owns a trust company and where all the partners will be deemed to jointly own the trust company and therefore all be attributed with a majority stake in it. If the protector and/or enforcer is a body corporate, a person who has control of the protector or enforcer may be a PSC of the underlying UK entity. ‘Control’ includes a situation where a right of the protector and/or enforcer is exercisable only (i) by that person, (ii) in accordance with that person’s directions or instructions, or (iii) with that person’s consent or concurrence. Where a trust indirectly owns a regulated business (eg a financial services business) the requisite control may not be held if the exercise of rights is subject to regulatory approval. Where other vehicles are used, such as foundations, consideration needs to be given as to whether or not a guardian or settlor effectively controls the exercise of rights held by the members of the foundation council and those rights are equivalent to voting rights held by shareholders or members in a company – if so, this may attribute the guardian or settlor with a majority stake in the foundation. Any bye laws relating to the foundation should be examined, as well as the foundation deed and any supplementary foundation deed(s). 11. Does it matter that I have not taken any steps to confirm the position and identify myself to the underlying UK legal entity? A person who has not received a notice asking them to confirm whether or not they are a PSC of a UK entity but who knows, or ought reasonably to know, that he or she is a PSC, is required to notify the underlying UK entity. The obligation to notify arises once the circumstances have continued for at least a month and provided that the person’s details are not already on the relevant entity’s PSC Register. 12. The underlying entity is an LLP and I do not have any indirect rights over the LLPs voting rights – could I still be a PSC? The first condition for LLPs is different to that for UK companies and looks at whether a person holds, directly or indirectly, the right to share in more than 25% of any surplus assets of the LLP on a winding-up. Even though, therefore, a person may have no indirect interest in an LLP’s voting rights, they may nonetheless be caught as a PSC of the LLP if they indirectly have an interest in more than 25% of any surplus assets of the LLP on a winding-up, perhaps by virtue of having a majority stake in entities in a holding structure. A similar test applies to Scottish Limited Partnerships and ‘qualifying’ Scottish Partnerships. 13. Would you please remind me of the five conditions? We have set out the five conditions out in Part 1 of Schedule 1 to this note. 14. Please would you remind me of the majority stake test? We have set out the definition of ‘majority stake’ in Schedule 2 to this note. 15. Do any other rules apply where the underlying company is a public company incorporated in England and Wales? Yes. A shareholder in a public company (whether unlisted or listed) incorporated in England and Wales may be required by notice issued in accordance with the Companies Act 2006 to disclose its ultimate beneficial ownership. There is no minimum threshold for disclosure and disclosure may ultimately be required up to the top of a chain of ownership (and by reference to economic rights rather than voting rights). Please see Schedule 7 to this note for a detailed explanation of these disclosure rules and Schedule 8 to this note for an illustration of how the rules work in the context of example corporate structures. 16. What if the underlying company has its shares traded on a regulated market, such as the London Stock Exchange Main Market or prescribed markets, such as the AIM market or the NEX Exchange? Companies listed on UK markets either have to comply with the Disclosure Guidance and Transparency Rules sourcebook ('DTR') or will adopt equivalent disclosure obligations (or equivalent rules in another country will apply to them). Generally speaking, the DTR requires disclosure of interests (direct or indirect) of 3% or more in the voting rights of relevant listed companies but does not attribute control to the same extent as the PSC Regime. However, it should be noted that UK incorporated companies listed on AIM or the NEX Exchange additionally have to comply with the PSC Regime. 1. The first condition – ownership of shares The first condition is that X holds, directly or indirectly, more than 25% of the shares in Company Y . (c) 75% or more of the share capital or voting rights. 3. The third condition – right to appoint or remove directors The third condition is that X holds the right, directly or indirectly, to appoint or remove a majority of the board of directors of Company Y. The reference to the right to appoint or remove a majority of the board of directors of the legal entity is to the right to appoint or remove directors holding a majority of the voting rights at meetings of the board on all or substantially all matters. A right will be held indirectly if the person has a majority stake in the intervening legal entities. Please see Schedule 2 to this note for an explanation of what will constitute a majority stake. Please note, however, that interests of other persons may be aggregated if there is any non-legally binding custom or practice or other ‘arrangement’ and certain rights may be ignored for the purposes of calculations, eg if subsidiary companies hold voting rights in holding companies. (c) a director who also owns important assets or has key relationships that are important to the running of the business (eg intellectual property rights) and uses this additional power to influence the outcome of decisions related to the running of the business of the company. Please note that, if a person already meets one of the first three conditions, the company does not have to record in its PSC register if and how that person meets the fourth condition. 5. The fifth condition – trusts, partnerships etcThe fifth condition is that (a) the trustees of a trust or the members of a firm that, under the law by which it is governed, is not a legal person meet any of the other conditions (in their capacity as such) in relation to Company Y, or would do so if they were individuals; and (b) a person has the right to exercise, or actually exercises, significant influence or control over the activities of that trust or firm. Similar conditions apply to LLPs, Scottish Limited partnerships and Scottish ‘qualifying’ general partnerships with amendments to reflect the corporate governance structure of LLPs and these are set out in Part 2 of this Schedule 1. (1) The first condition is that X holds, directly or indirectly, the right to share in more than 25% of any surplus assets of LLP Y on a winding-up. (2) For the purpose of sub-paragraph (1), to the extent that the holding of a right to share in any surplus assets of LLP Y on a winding-up is not expressly provided for, each member of the LLP shall be treated as holding the right to an equal share in any surplus assets on a winding up. The second condition is that X holds, directly or indirectly, more than 25% of the rights to vote on those matters which are to be decided upon by a vote of the members of LLP Y. (1) The third condition is that X holds, directly or indirectly, the right to appoint or remove the majority of the persons who are entitled to take part in the management of LLP Y. (2) For the purposes of sub-paragraph (1), the right to appoint or remove a majority of the persons who are entitled to take part in the management of LLP Y includes the right to appoint or remove those persons who hold a majority of the voting rights at meetings of the management body of LLP Y. The fourth condition is that X has the right to exercise, or actually exercises, significant influence or control over LLP Y. (b) X has the right to exercise, or actually exercises, significant influence or control over the activities of that trust or firm. (1) The first condition is that X holds, directly or indirectly, the right to more than 25% of any surplus assets in eligible Scottish Partnership Y on a winding up. (2) To the extent that the holding of a right to any surplus assets of an eligible Scottish partnership on a winding up is not expressly provided for, each partner in the eligible Scottish partnership shall be treated as holding the right to an equal share in any surplus assets on a winding up. The second condition is that X holds, directly or indirectly, more than 25% of the voting rights in eligible Scottish Partnership Y. The third condition is that X holds the right, directly or indirectly, to appoint or remove the majority of the persons who are entitled to take part in the management of eligible Scottish partnership Y. The fourth condition is that X has the right to exercise or actually exercises, significant influence or control over the eligible Scottish Partnership Y. The fifth condition is that: (a) the trustees of a trust or the members of a firm that, under the law by which it is governed, is not a legal person meet any of the other specified conditions (in their capacity as such) in relation to eligible Scottish partnership Y, or would do so if they were individuals, and (b) X has the right to exercise, or actually exercises, significant influence or control over the activities of that trust or firm. The terms ‘significant influence’ or ‘control’, which are used in the fourth and fifth conditions, are not defined in the legislation governing the PSC Regime. Instead, the UK Government published statutory guidance on the meaning of ‘significant influence or control’ over companies in the context of the Register of People with Significant Control issued on 14 April 2016 (the ‘Statutory Guidance'). The Statutory Guidance provides that ‘significant influence’ and ‘control’ are alternatives. Where a person that can direct the activities of a company, trust or firm, this would be indicative of ‘control’. Where a person can ensure that a company, trust or firm generally adopts the activities which they desire, this would be indicative of ‘significant influence’. The ‘control’ and ‘significant influence’ do not have to be exercised by a person with a view to gaining economic benefits from the policies or activities of the company, trust or firm. Generally, being a director of a company (or the foreign equivalent) is an ‘excepted role’ and a person would not be a PSC of a company under the fourth condition purely because they are a director of it, unless they were carrying out their role in a manner which was ‘out of the ordinary’, or if their role as a director forms one of several opportunities which they have to exercise significant influence or control. Aside from directors, a person might hold a right to exercise significant influence or control over a company for the purposes of the fourth condition as a result of a variety of circumstances including the provisions of the company’s constitution, the rights attached to the shares they hold, a shareholders’ agreement or some other agreement. For example, a person might have significant influence or control if they have absolute decision rights or veto rights over matters such as adopting or amending the company’s business plan, changing the nature of the company’s business, establishing a share option scheme or similar, or making additional borrowing from lenders. (iii) a director who also owns important assets or has key relationships that are important to the running of the business ( eg intellectual property rights) and uses this additional power to influence the outcome of decisions related to the running of the business of the company. However, a person’s relationship with a company would need to be considered on a case by case basis for the purposes of determining whether they meet the fourth condition. In addition, the directors of a UK company would need to carefully consider whether as a matter of fact they regularly take decisions based on the views or recommendations of any persons. The Statutory Guidance sets out a number of examples of rights which might constitute a right to exercise significant influence or control together with examples of rights which would not. If a person has absolute decision rights over decisions relating to the running of the business of the relevant company, such as adopting or amending the company’s business plan, changing the nature of the company’s business, making additional borrowing, appointing or removing the CEO, establishing a bonus or incentive scheme or granting options, then this might give them significant influence or control over the company. If a person has absolute veto rights over decisions related to the running of the business of the relevant company, such as adopting or amending the company’s business plan, or making additional borrowing, or if the person holds absolute veto rights over the appointment of the majority of directors, then this might give them significant influence or control over the company. ‘Absolute’ in relation to decision or veto rights means that a person has the ability to make or veto a decision without reference to or collaboration with anyone else (although regard still must be had to whether the person is acting under a joint arrangement ). In terms of the fifth condition, according to the Statutory Guidance a person has the right to exercise significant influence or control over the activities of a trust if they have the right to direct or influence the running of the activities of the trust, for example, the right to appoint any of the trustees, except through application to the courts, the right to direct the distribution of funds or assets, the right to direct investment decisions of the trust, the right to amend the trust deed or declaration of trust, or the right to revoke the trust. A person actually exercises significant influence or control over a trust if they are regularly involved in the running of the trust, for example a person who issues instructions, which are generally followed, as to the activities of the trust to the trustees. This may be a settlor or beneficiary who is actively involved in directing the activities of the trust. (2) the last of which holds the share. (2) the last of which holds that right. (iv) A has the right to exercise, or actually exercises, dominant influence or control over B. (ii) the directorship is held by the legal entity itself. A US limited liability corporation with a sole manager which is itself an LLC, acting as manager, may find that LLC is thereby attributed with a majority stake. 2. What is dominant influence (as referred to in paragraph 1(c)(iv) above)? The Companies Act 2006 defines dominant influence, in the context of the definition of a parent undertaking as: ‘a right to give directions with respect to the operating and financial policies of that other undertaking which its directors are obliged to comply with whether or not they are for the benefit of that other undertaking’. Accounting standards have described the actual exercise of ‘dominant influence’ as being ‘the exercise of an influence that achieves the result that the operating and financial policies of the undertaking influenced are set in accordance with the wishes of the holder of the influence and for a holder’s benefit, whether or not that holder’s wishes are explicit’. A power of veto might give a holder dominant influence for the purposes of the majority stake test although it has been suggested that this would only be the case if the power of veto was held along with other rights or powers, or if the veto rights apply to the day to day operation of the undertaking and no similar veto is held by other persons unconnected to the holder. This might mean that when you look at a chain of companies to analyse if each has a majority stake in the level below, a link in the chain is ignored because an entity higher up has dominant influence over an entity several links below. The link which is ignored might be one where voting rights have been split between two or more entities which at first sight might lead you to think that there was no chain of majority stakes. The factual analysis might, however, show that the relevant link should be ignored and that therefore the chain of control had not been broken for the purposes of the Companies Act 2006. A trust or firm may be attributed with an interest by virtue of the majority stake test which then requires you to examine if any person has the right to or actually exercises significant influence or control over the activities of the trust or firm. UK-incorporated public companies are subject to the provisions of sections 793-828 of the Companies Act 2006 (the ‘section 793 regime'). This regime allows a public company to issue a notice requiring a person it knows, or has reasonable cause to believe, has an interest in its shares (or to have had an interest in the previous three years) to confirm or deny the fact, and, if the former, to disclose information about the interest, including information about any other person with an interest in the shares. (b) any restraints or restrictions to which the exercise of any right attached to the interest is or may be subject shall be disregarded. This will catch, amongst other interests, those of beneficiaries of a trust (including discretionary beneficiaries), as well as those held by a person’s spouse, civil partner, infant children or step children or held through corporate vehicles. The interests of infant children and step children are attributed to their parents. The courts have described the broad definition of ‘interest in shares’ as being designed ‘to counter the limitless ingenuity of persons who prefer to conceal their interests behind trusts and corporate entities’. A company is also allowed to ask for any particulars it sees fit as regards a person’s interest in shares. In one case, it was said that the definition of interest in shares ‘casts a net so wide and finely meshed that in a case like this in which a complicated structure of trusts and companies has been created, a request for the identity of all persons interested will trawl a large number of parties /…/ an enumeration of names would not enable the company to discover the real owner of the shares unless it could ask which were the sharks and which were the minnows’. The section 793 regime also attributes an interest in shares to persons who have an indirect interest. The test is different to the majority stake test under the PSC Regime in that the section 793 regime attributes an interest to entities which ‘control’ one-third or more of the voting power of an underlying entity (rather than, in the case of the majority stake test under the PSC Regime, more than 50% of the voting power, the right to appoint or remove a majority of the board of directors or dominant influence). (b) he is entitled to exercise or control the exercise of one-third or more of the voting power at general meetings of the body. (ii) he is entitled to exercise or control the exercise of one-third or more of the voting power at general meetings of that body corporate. (2) he is under an obligation (whether or not subject to conditions) the fulfilment of which would make him so entitled. Where a company or other body corporate holds shares, any person in accordance with whose directions that company or its directors are accustomed to act and any person entitled to exercise or control the exercise of one-third or more of the voting power at general meetings of that company or body corporate, will be deemed to be interested in those shares. This ensures that any indirect interests held through a chain of companies or bodies corporate are caught. If a body corporate does not have share capital, voting power is likely to be equated with the right under the constitution of the body corporate to direct its overall policy or alter the terms of its constitution. 3.1 What does ‘accustomed to act in accordance with his directions or instructions’ mean? Ultimately, whether or not a person is a shadow director is a question of fact. In one case it was determined that whilst ‘the management [of the company] were aware that X had been keeping an eye on the fortunes of the business and that X wanted to be provided with information to enable him to do that, there was nothing that went beyond the involvement that one would have expected to see from a person who combined the roles of major client and chairman of the majority shareholder. There was no evidence that the majority of the board [of the company] were accustomed to act in accordance with X’s instructions’. In some situations, however, a third party, such as a beneficial owner of a company, who communicates advice or guidance to the directors will be a shadow director. Non-professional advice may fall within the statutory description of ‘directions or instructions’. It is possible therefore that even if directors give independent consideration to any proposed action, a non-professional ‘adviser’ may be a shadow director (and therefore may also be attributed with an interest under the section 793 regime). It may therefore not be enough for directors to show they have given independent consideration to requests from a third party (often a beneficial owner of a company’s shares). Regular approval of proposals put to the board may render the ‘proposer’ a shadow director, and attribute to the ‘proposer’ an interest under the section 793 regime. 3.2 What about agreements to acquire interests in shares? Under the section 793 regime, an interest can arise as a result of a person being a party to an agreement to acquire shares. This would be the case where two or more persons are party to an agreement or arrangement under which interests in shares in a particular public company will be acquired. The agreement or arrangement does not have to be legally binding, but must include obligations or restrictions on one or more of the parties on their use, retention or disposal of their interests in the shares in the public company acquired under the agreement, and the shares must be actually acquired in pursuance of the agreement. Until the acquisition takes place, the parties to the agreement will not have an interest by virtue of the arrangement, but once the acquisition has occurred, each party is treated as being interested in all of the shares in which any other party to the agreement is interested. This means that under the section 793 regime, a company can serve a section 793 notice on someone who it thinks may have entered into a concert party type arrangement with others in respect of acquiring shares. These arrangements must be disclosed, including the names and addresses of the other parties to the agreement and a statement of how many shares the person is deemed to have an interest in as a result of the agreement. The courts have held that information regarding agreements or arrangements between different people in respect of shares can be requested from beneficial owners. It was held in one case that ‘an understanding that one party will provide the money to buy shares and that another will acquire them and vote them in a certain way would have significant mutuality’ and would need to be disclosed as an agreement to acquire an interest in shares. 3.3 What about the interests of a non-UK person? The principle that UK legislation applies to a foreigner’s interests in English property, whether or not he has an actual presence in this country, means that the section 793 regime is applicable to a foreign beneficial owner. The courts have held that there is no justification for interpreting ‘any person’ in the section 793 regime as excluding foreigners who might believe that they could avoid British jurisdiction by not coming into the UK. However, there is doubt about the extent of the application of the criminal sanctions under the section 793 regime to foreign persons with no UK presence. In terms of enforcement, the imposition of restrictions on shares will apply equally to persons not resident in the UK. Section 793 notices are not uncommon, with some listed companies issuing them regularly. Supplementary notices by issuers seeking to force disclosure of beneficial ownership through a chain of nominees are, however, less common (save where a person is seen to be stake-building in anticipation of making a bid). Members of a company holding at least 10% of the Company’s paid-up capital and voting rights can compel the company to issue a section 793 notice. Whilst section 793 does not apply directly to non-UK issuers (for example, a BVI incorporated issuer), it is common practice for the sponsor (for a main market issuer) or the nominated adviser (for an AIM issuer) to require a non-UK issuer to incorporate similar provisions into its articles of association or by-laws (or equivalent) upon IPO, in order that the obligations mirror those that apply to UK-incorporated listed companies. Information disclosed in response to a section 793 notice is kept on a separate register by the issuer at its registered office. Should the issuer receive a request from a person wishing to inspect the register, it must comply with the request and allow inspection without charge unless it is satisfied the request is not for a proper purpose. A person who fails to comply with a section 793 notice commits an offence unless he proves that the requirement to give information was frivolous or vexatious. In addition, there are a number of practical steps a company can take to enforce a section 793 notice. A company can apply to the court for an order imposing restrictions on the shares or take action to impose certain restrictions itself, provided always that its articles of association allow it to do so. A company may include provisions in its articles providing that where a person has failed to comply with a section 793 notice that has been duly served, the board may serve a notice on the person directing that he may not vote on those shares or appoint a proxy. In practice, however, a company needs to be careful that the power to disenfranchise a shareholder is exercised for a proper purpose. (iii) restrictions on the transfer of shares other than a sale to a genuine unconnected third party. Sanctions must cease to apply not more than seven days after the earlier of the company receiving notice that the shares have been sold to an unconnected third party or due compliance with the section 793 notice. The Supreme Court has held that the directors’ powers under a company’s articles to impose a restriction on shareholders’ rights may be exercised only for the purposes for which they had been conferred. Where the power to impose restrictions had been conferred to provide a remedy where a shareholder had failed to provide accurate information in response to a section 793 notice, it could only be exercised for that purpose. Such a power could not, for example, be used as a tactical tool to disenfranchise shareholders from voting at a forthcoming shareholders meeting and restrictions imposed for such an improper purpose would be set aside. If a person fails to provide a company with information required by a section 793 notice within the relevant timeframe, the company may use the statutory court procedure to apply for a court order directing that the relevant shares be subject to restrictions. (d) except in a liquidation, no payment may be made of sums due from the company on the shares, whether in respect of capital or otherwise (ie so no dividends will be paid). There is no discretion on the part of the company or the court to choose to apply any fewer or any other restrictions. A person or the company itself can apply to the court where it considers that an order imposing restrictions on shares may unfairly affect the rights of third parties in respect of the shares. If the court agrees, it may direct that certain actions should not constitute a breach of the restrictions. It is an offence to evade the restrictions imposed by a court order, which includes disposing of the shares, voting on the shares or appointing a proxy. A person or the company itself can also apply to the court for the restrictions to be removed. The court must not make an order for restrictions to be removed unless it is satisfied that either the relevant facts about the shares have been disclosed to the company and no unfair advantage has accrued to any person as a result of the earlier failure to make that disclosure or the shares are to be transferred for valuable consideration and the court approves the transfer. The court may, where it approves a transfer of shares which are subject to restrictions, order that certain restrictions continue to apply. Careful consideration needs to be given to investment structures employed for investing in UK plcs and the disclosure implications for ultimate beneficial owners. A review of who will be treated as a ‘person with significant influence or control’ should also be conducted in parallel. In summary, the section 793 regime catches a wide array of persons given that there is no minimum threshold for the level of interest which needs to be disclosed and also given that the threshold for attributing indirect ownership is one-third of the voting rights of intermediate holding companies rather than the ‘majority stake’ test which applies under the PSC Regime. In other respects, the section 793 regime is narrower in that there is no concept of ‘joint arrangement’. This means that, so long as a person does not ‘control’ interests which would otherwise be treated as held pursuant to a joint arrangement under the PSC Regime, a split interest (ie less than one-third) in an intermediate holding entity may block disclosure further up the chain if the level of ‘control’ is less than one-third of the voting rights of the relevant entity and provided that there is no person who would effectively be a shadow director of that entity who would otherwise need to be disclosed.